We understand it can be difficult for young riders to find affordable and quality insurance. Your age and lack of riding experience are two of the factors leading to higher insurance premiums, which can put a serious dent in both your biking plans and your bank balance. But help is at hand. We've been insuring young riders for more than a decade and as a result our experienced team is on hand to help riders aged 25 and under find the best level of cover for their needs. Using our panel of insurers we work hard to get you the most competitive quotes. Whether you are aged 16 and about to purchase a moped, or if you want to beat the traffic on your stylish new scooter, we have policies tailored to suit. As a young, less experienced rider your insurance could cost you considerably more and while this may be extremely frustrating there are ways that could help to reduce your premium in the long-term. First step, choose a bike with a smaller/less powerful engine. 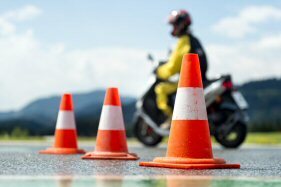 Consider taking additional training such as the Institute of Advanced Motorists (IAM) advanced test, this not only will this help to enhance your skills but make you a safer biker. It goes without saying a clean driving record will benefit you later on, particularly when it comes to renewing your policy. The same rule applies to looking after your bike. If you keep it in a garage and use fitted insurance approved security locks, then not only will it deter any potential thieves and help reduce the likelihood of it getting damaged but it could also help to reduce your premium. We operate a UK Contact Centre with our specialist bike team on hand to help answer any questions or talk you through your insurance cover. You should also consider taking out optional extras that could pay dividends later on including valuable UK Breakdown cover, Helmet and Leathers cover, which will protect your motorcycle safety clothing in the event of an accident, along with Key Protection, Legal Expenses, Bike Hire, Personal Accident and Excess Protect cover. We provide a range of motorcycle insurance cover from third party only, which will cover you and your bike against claims which were not your fault, through to fully comprehensive insurance, giving you total peace of mind with covers for theft, loss and damage to the bike. Regardless of whether it's your first or second bike, we can help find the best policy to suit you. Simply contact us or get a quote online.